[miau] Almost every online gambler out there knows about Microgaming and its impressive lineup of video games. Where they excel, however, is with slot machines, and nowhere is this more apparent than with their mega-hit release Mega Moolah. This particular slot machine is considered one of the most-played slots of all time. And the ironic thing is that it really isn’t that impressive of a game. It has basic symbols, a no-frills type of setup, but an incredibly large progressive jackpot that millions of people clamor over in attempts to win the big money. 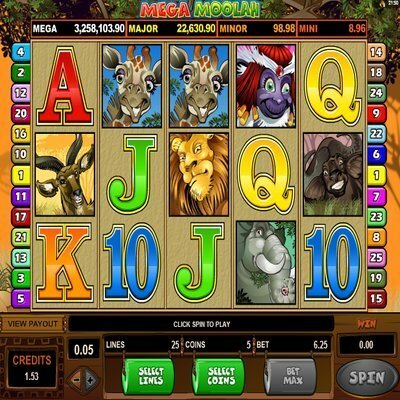 Though even without offering the progressive jackpot, Mega Moolah still might be a top game. Its simplicity is something many gamers love. Mega Moolah isn’t exactly a new game on the scene. It has been around for a few years, and it keeps climbing in popularity due to the progressive nature of the jackpot, which could literally climb into the millions of dollars (or equivalent) depending on how many people are playing. So, without a doubt, that’s the machine’s number-one feature: The progressive, ever-climbing, big-dollar jackpot. However, that’s not the only feature that will catch a player’s eye. This is a safari-themed game, so you have a lot of wild jungle animals that will really brighten up any dark room. Giraffes and elephants and lions are cool symbols to have alongside the typical playing card symbols. Mega Moolah is a 5-reel, 25-payline slot machine whose best features, outside of the huge jackpot, are actually bonus features earned after spinning. For instance, the purple princess scatter symbol can offer different payouts from 2 and 3x to 20 and even 100x the initial bet. If you’re lucky enough to get 2, 3, 4, or 5 of these symbols, then consider yourself paid! There’s also a wild symbol on the reels, a Lion, which will double a player’s winnings and also help to increase the odds of winning on any particular line. The betting options cannot be talked about without going into a bit of detail on the progressive jackpot options. In total, there are four separate progressive jackpots that can be won and added to while playing Mega Moolah. You do not have to place any type of specific bet for the jackpots either; as long as you’re playing, you’re eligible to win. The jackpot bonus round will be triggered randomly, but the more you stake at the beginning of the round, the more chances you’ll have to actually win the large jackpot. Other than that, the betting options are fairly standard. You can play as little as 0.01, or you can get as high as 100 in some instances. You can bet on individual lines, use the autoplay feature, and really mix and match how you go about attempting to win the jackpot. One thing that’s apparent with these types of machines is that the total jackpot always makes the initial game look better. Mega Moolah is about graphically average, with a cool theme and many ways to bet. But even if it had the worst graphics out there, people would still line up in hopes of winning that progressive jackpot. And that’s what makes this slot so fun.